Dexter is the eponymous label of Tod and Debbie Dexter, based at Merricks North on the Mornington Peninsula. The vineyard was established in 1987. Now just over 7 hectares, it’s planted to Chardonnay and Pinot noir in roughly equal proportions. The vine age for the Chardonnay averages 20 years and the Pinot 15 years. Tod Dexter’s wine journey would make an article by itself. Suffice to say that he started it early in life through family connections with the Crittenden (wine merchant) family in Melbourne, followed by seven years’ apprenticeship working at Cakebread Winery in California. On his return to Australia, he studied winemaking at Roseworthy Agricultural College formalising that apprenticeship, spent ten years making wine at Stonier Winery at Merricks (establishing its fine reputation for Pinot Noir and Chardonnay) and a further period of winemaking at Yabby Lake. Until 2006, all fruit from the vineyard was supplied to Stonier Winery for the Stonier Reserve wines. After the stint making wine for Yabby Lake and with a bit more than subtle encouragement from friends and family, Tod and Debbie struck their new label with the first vintage in 2006. The point of all this is that while it’s a relatively new label, the wines come with a very healthy provenance. The vineyard is well established and the fruit it bears is well understood and handled by a talented and experienced winemaker. Dexter Mornington Peninsula Chardonnay 2010 – bright lemon gold, some green tinges; first sniff reveals a slight struck matchstick; palate is all melon, peach and nutty, crisp grapefruity acids, fine intense and long, very long; complex, gorgeous mouthfeel. This will age well in the medium term, but drinks so well now. Screwcapped; I drank with great pleasure one of 7500 bottles made. 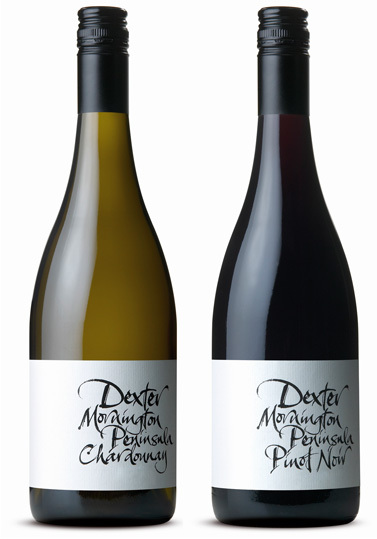 Dexter Mornington Peninsula Pinot Noir 2010 – medium red/purple akin to a ripe satsuma plum; sweet dark cherry with charry oak, spicy with lovely spread of fleshy flavours around an intense core of that dark ripe cherry; some earthy notes developing. This wine will develop further complexity and needs another 12 months or so in bottle to do that and should hold well until its 10th birthday, and perhaps beyond. But like the Chardonnay it already drinks very well and will provide maximum medium term enjoyment. Screwcap. 8400 bottles made. Just to qualify my guesswork above, I think the jury is still out on how well and at what rate wine will develop under screwcap, except to say that the evidence points to freshness and primary flavours being retained for longer than under cork. These wines are so well made and so balanced and fresh, who knows for sure what their longevity will be, or how long it will be before they develop the complexities they promise? The wines are available through the website (www.dexterwines.com.au) and at a large number of good restaurants and specialist retailers in Australia. Given the first vintage was 2006, the spread of availability is impressive, and speaks for the quality of the wines. They are also now available in New York, through Little Peacock Imports LLC (www.little-peacock.com) and in the UK through Hallgarten Druitt & Novum Wines (www.hallgartendruitt.co.uk).